The Pablo Center at the Confluence in Wisconsin used stone, copper, and insualted metal panel to fit into its surrounding structures. 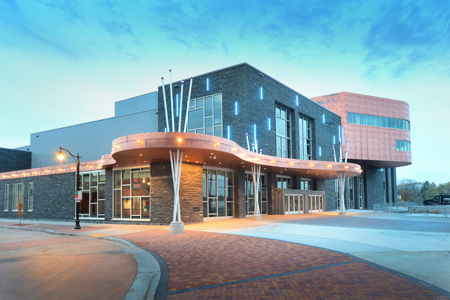 The Pablo Center at the Confluence in Wisconsin fits into its site where the Eau Claire and Chippewa Rivers meet, using traditional and practical building systems such as insulated metal panels (IMPs). More than 2778 m2 (29,900 sf) of IMPs were installed on the project. IMPs were filled with a 76-mm (3-in) urethane core. The 22-gauge exterior metal on the panels is weathered zinc, and the 26-gauge interior metal on the panels is white in color. The metal wall panels feature distinctive 38-mm (11/2-in.) high ribs on 183-mm (7.2-in.) centers. The IMPs house the main theater. Additionally, the façade uses 1672 m2 (18,000 sf) of shop-fabricated copper, and a 89-mm (31/2-in) sawn height of Aqua Grantique stone.